The leadership of change is at the heart of modern business since no organisation can stand still in today's dynamic environment. Successful leadership means that the cycle of change management is always in progress with different emphases at different times. 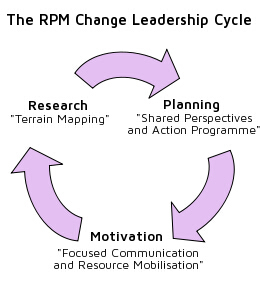 The diagram shows how the three aspects of Research, Planning and Motivation fit into a cycle which, if maintained, will enable the organisation to adapt and change successfully in a dynamic environment.